Take Your Adventure to the Stars! Welcome to Dragonstar, a boundless universe of magic and machine, science and sorcery. Intrepid adventurers explore the Outlands in starships powered by fusion fire and arcane rituals. Dwarven propectors work veins of pure adamantine in remote asteroid belts, and elven loremasters conduct secret experiments in living space stations. Grizzled mercenaries augment their bodies with bioengineered spellware, and orc raiders with pulse lasers massacre innocents on isolated colony worlds. 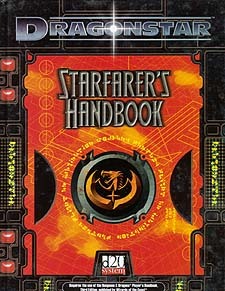 Dragonstar is a unique space-fantasy campaign setting for the d20 System from Fantasy Flight Games. The Starfarer's Handbook provides everything you need to run adventures and campaigns in this exotic setting. This book allows you to incorporate your own fantasy world into the Dragonstar universe or introduce high technology and space opera elements into your ongoing campaign. The Starfarer's Handbook includes new character classes, races, skills, feats, spells, high-tech equipment, firearms, robots, and vehicles. The book also presents new d20 System rules for firearms and vehicle combat.